Jim Hagen and Rod Bennett work out a few changes before a gig. 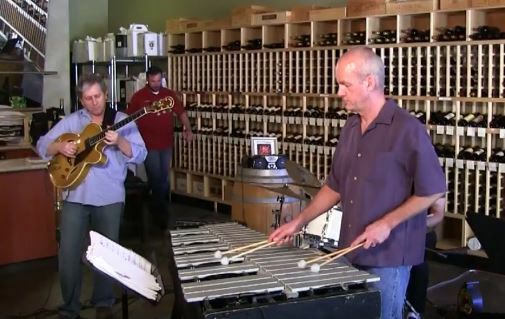 Jim Hagen and Rod Bennett work out a few changes before a 2013 gig at Valencia Wine Company. 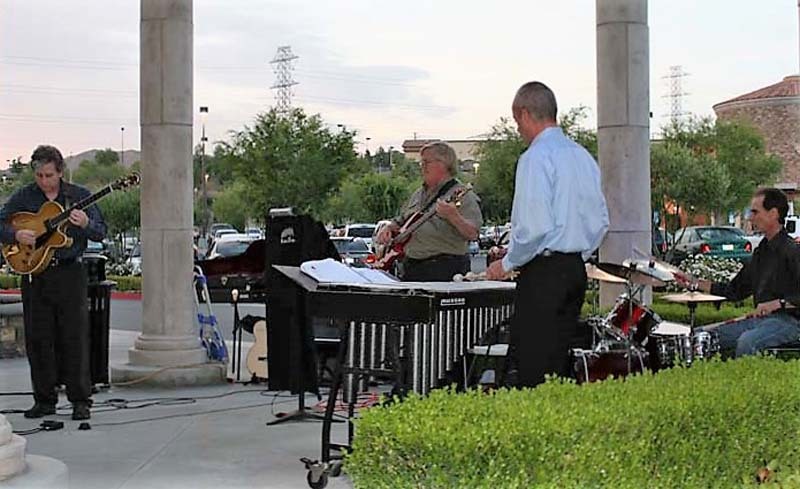 Santa Clarita jazz vibes and percussion ace Rod Bennett, who died in a hit-and-run collision with a car while riding his bike in Placerita Canyon Wednesday, May 25, gigged and recorded with Santa Clarita jazz guitarist and bandleader Jim Hagen for the past decade, in a few different iterations of Hagen’s group. One of them, RainTree Jazz, included this writer on drums in 2010-2012. 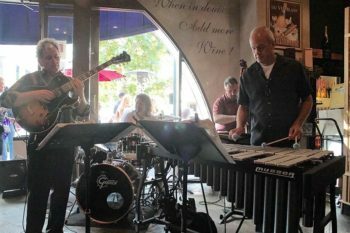 For the last couple of years, Hagen has called his band Hagen Jazz, and they’ve enjoyed a stable roster with Hagen, Bennett, bassist Roger Brooks and drummer Lance Allyn, with musician-producer Jerry Danielsen occasionally sitting in on keyboards. “I got the news from (Bennett’s wife) Valerie Pryor (Wednesday) night,” Hagen wrote on his Facebook the next morning. “Rod Bennett was a good friend and bandmate. I learned a lot about jazz from him because he was an excellent musician. Over the years, we played countless gigs together, and even had a couple of gigs planned for next week. “A couple of months ago, after one of our gigs, I was approached by one of his former (Arroyo Seco Junior High School math) students who saw him on the bandstand. The student thought Rod looked familiar and was trying to figure out who he was. Finally, it dawned on her that it was ‘Mr. Bennett’! She said he was the best teacher she ever had. I meant to tell him, but never got the chance. “This is just one of many stories that show that Rod was an exceptional person who touched the lives of many, far and wide,” Hagen wrote. 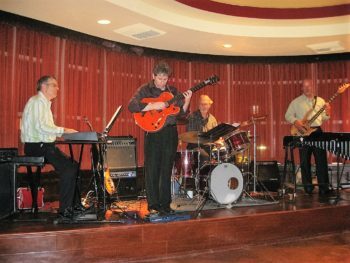 Michael Hearn, Jim Hagen, Jim Morrison, Rod Bennett, Bella Cucina, Santa Clarita, October 2009. Stephen K. Peeples: When did you guys first meet? When did you start playing music together? Jim Hagen: It was great knowing Rod. He was just a wonderful person. We met about 10 years ago. It’s been a while. We met through a mutual drummer friend by the name of Jim Morrison. He was a teacher out here. It was actually my daughter Paige who introduced me to Jim Morrison. Jim Morrison the drummer and I were jamming, and we were looking around for a bass player. Jim Morrison was in contact with a bass player named Harry Ostrum, who was a substitute teacher. We played with Harry for a little while. Harry recommended Rod for us, to play bass. So, Rod came to a rehearsal, and the three of us were jamming. We started talking and I came to found out that not only did Rod play bass, but he played the vibes as well. We thought that was wonderful. So, the next time we had practice, we told him to bring his vibes. Rod doubled on the vibes and the bass for us. He was a very talented individual. 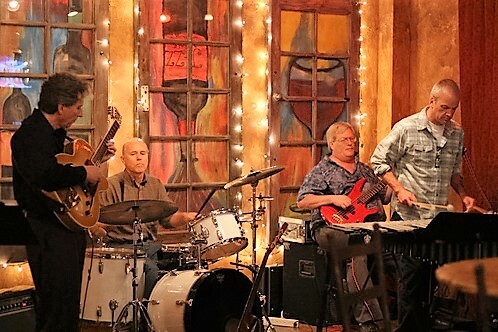 RainTree Jazz: Jim Hagen, Rusty Amodeo, Rod Bennett, Stephen K. Peeples, George’s Bistro, May 21, 2011. Photo: Nadine A. Peeples. Peeples: He was just standing there behind his vibes with the bass strapped on? How was he doing that? How many hands did he have? Hagen: He and I would switch off on the bass guitar duties. That was almost 10 years ago. The band personnel changed over the years, but Rod and I always stayed together and worked together. Peeples: So you and Rod were constants in your groups over the last decade. Talk a little bit about the live gigs you played, at some of the places around town that people might have seen you perform. Hagen: Our first gig was at a place called All Corked Up. We went there one night just to play for free, just to get out and play. They liked us a lot and asked us to come back, so we played there several times. Peeples: All Corked Up, the wine bar in the Centre Pointe area of Santa Clarita. 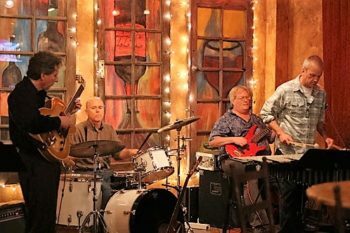 Jim Hagen, Chuck Standish, Rusty Amodeo, Rod Bennett, All Corked Up, December 2012. Hagen: Yes. Then we played there again when it became All Corked Up II, I guess – whatever the next iteration was. (Cheers @ All Corked Up, which opened in spring 2012 and closed Dec. 31, 2013). We played a lot of private parties and Christmas parties and things like that. Then we had a steady gig at Valencia Wine Company, on Town Center Drive in Valencia. We played there every Sunday for a good two years. We still play there occasionally, about once a month. Peeples: Did you guys just play Valencia Wine the first time and they asked you to stay? How did that “residency” happen on Sunday nights? 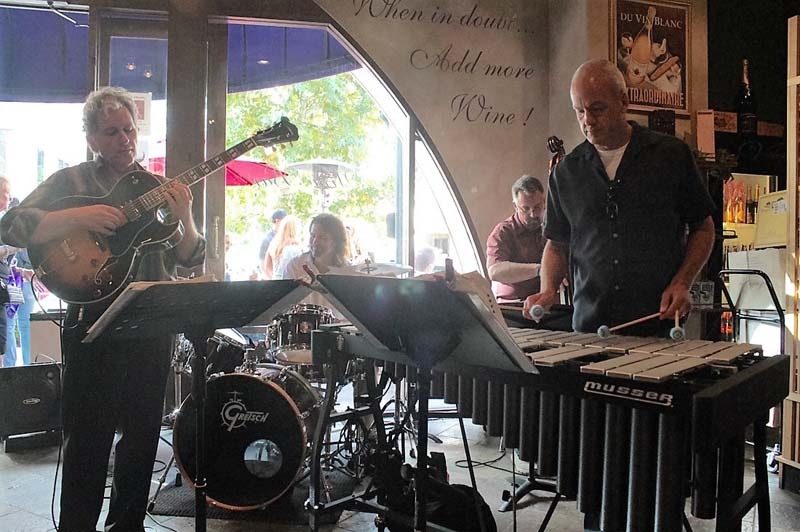 Hagen: I went to Guy LeLarge, the owner, and asked him if he’d be interested in having a jazz group play there on Sundays, and he said he was interested. So, we went in and played on Sundays. At first it was every other week or so, but then eventually Guy asked us to play every Sunday. That went on for about two years. Jim Hagen, Lance Allyn, Roger Brooks, Rod Bennett, Valencia Wine Company, Valencia, California, 2015. Peeples: Let’s talk more about Rod’s musicianship for a minute, which was pretty stellar. He was a teacher as well as a player. He had to have something going on. What was it like for you to have Rod in the group? Hagen: Watching and listening to him work was just amazing. It’d always give me ideas of how I could play. It was more like a learning experience for me. We’d be playing a gig and I’d say, “Hey, Rod, why don’t you call out a song?” and he’d call one out, and it’d be a song I’d never heard of. He’d hand out the music, and I’d be like, “Okay, let’s give it a try…” And Rod played it flawlessly, you know, and I was just trying to keep up. But he would count the song off with perfect timing and get the proper tempo and we would play. He just made it sound so clear and purposeful. It was wonderful. And of course his solos were great. We’d be playing tunes that we knew, that everybody would know, and some of the solos he would come up with were just really amazing. 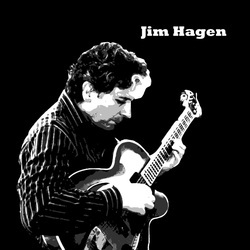 Jim Hagen 2012 album cover. Photo: Stephen K. Peeples. Peeples: You guys did some recording together. There was an album released a few years ago. Hagen: The end of 2012. I had been working on that one for a long time just by myself, but then I asked Rod to help me out on a couple of tunes, so he played the vibes on a couple of tunes. I needed a different element for the sound, and (the vibes) really opened the album up as far as having different sounds and diversity and just a different feel to it. Peeples: And there are some recordings that have yet to be released, I understand. Tell me about those sessions and what’s going to happen with the tracks. Hagen: I’ve been writing music for a new album for a while, and at this point we’re talking about 2015. Rod and I were working with Lance Allyn, who is a well-known musician here in town, and also Roger Brooks, who is an excellent musician as well, from Burbank. 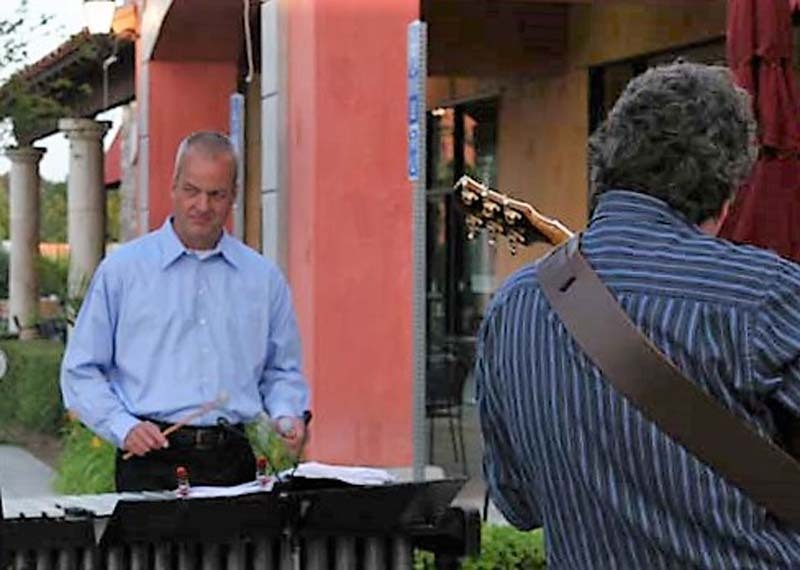 Both Roger and Lance are multi-instrumentalists and they can play any instrument you ask them to. For this particular project, Roger’s on the stand-up acoustic bass and Lance is playing the drums. And, of course, Rod’s playing vibes and I’m playing guitar. 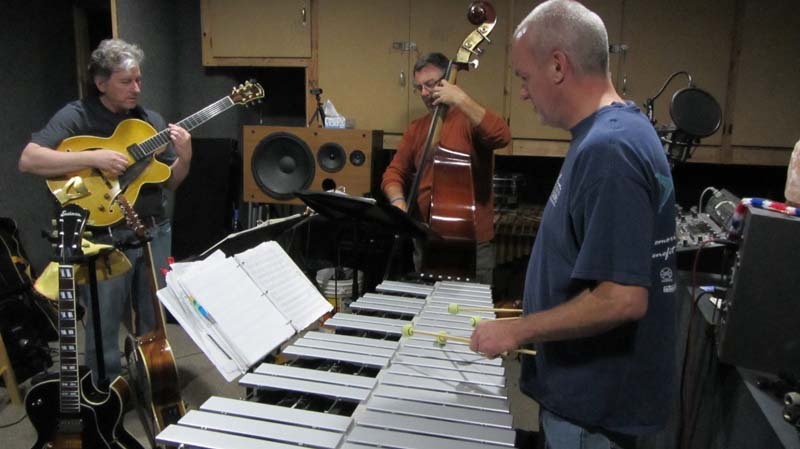 Rod Bennett (right) recording with Jim Hagen (left) and Roger Brooks, Busy Signal Studios, November 2015. We began rehearsing the material. I’d written everything out. They added their own parts, their own personalities and influences to it. We went into Busy Signal Studios, which is owned by Jerry Danielsen, and laid down all of the basic tracks. I asked Jerry to play some keyboards on the songs also, to give it a different flavor, and he did a wonderful job as well. We just went in there one day for about six hours. We laid down several tracks, but I selected four of them that I wanted to use. It’s pretty much a live album with the exception of a few overdubs here and there. I remember not too long ago, Rod came to one of the recording sessions. I asked him to lay down some incidental parts and some solos and things, and he came over and brought a lot of percussion instruments with him as well. He did his vibe parts, and then he put down a lot of percussion sounds. Wind chimes, congas, bongos, rattlers, triangles – and it was all placed in these perfect spots in these songs. You could tell he put a lot of thought into it. It’s just perfect for the music, and again, it opens the song up and gives it all this diversity in sound that it never would’ve had otherwise without his influence. We’re still working on that, trying to get the mixes right. It takes a little bit of time, but I hope to have it done soon. Peeples: Would you release that as a four-song EP? Hagen: I’d hoped to have a full album. I haven’t decided. At the very least it will be a four-song EP. I do have some other material Rod and I recorded at my house a few years ago that was never really released. They’re jazz cover tunes. So, I don’t know. Maybe I’ll put some of that on there. We’ll see. He sent me an MP3 a while back via email of an idea he had for one of the tracks we had laid down but we didn’t use. But his vibe work is so wonderful, I’m wondering if there’s some way technically we can get that into a new rhythm track and complete that song. I don’t know. We’ll have to wait and see. It depends on if I can get the original source material. But I don’t know. Jerry Danielsen − he’s a pretty good wizard in the studio. Peeples: Did he ever talk to you about who he listened to when he was coming up? Vibes players – the obvious guys would be Lionel Hampton, Bobby Hutcherson…Did he mention anybody specifically who really inspired him? Hagen: He really liked not only the people you mentioned, but Gary Burton as well. He really liked Gary Burton a lot. Rod was able to play with four mallets, which at one time was pretty unheard of, but I think a lot of people just assume a lot of vibes players play with just two mallets a lot. But Rod was able to do four. What made it so wonderful is that he’d lay out these really nice, luscious, expansive chords, and just really made the band sound complete and whole. But he would bring in a lot of material by other people as well. We would play a lot of Thelonious Monk. We played some Miles Davis, John Coltrane and all of the classics. He would bring in some standards as well, and we would play those. He would play the melody and just do a fabulous job. He was very diversified, and that was just his vibes playing. His bass playing – he could play all the bass parts, too. I’ve been playing guitar for almost 50 years, and when I met Rod, he had only been playing bass for about seven or eight years. But even though I played bass off and on, Rod was one of the best bass players I’d ever played with, in addition to his vibes playing. I’ve played with other vibes players as well, but there was something special about Rod and his ability to interpret the music and bring out his own sound. Peeples: You spent a lot more time with him than I did, but in the time I spent hanging out with the group and jamming with them, I never knew him to be upset about anything. His demeanor was always very pleasant, positive. Really fun guy to be around. That was my take. Hagen: He was very much like that. From a musician’s point of view, that was just one of the most wonderful things. I think that’s why our musical relationship had lasted for so long, because he had this ability to just allow you and all his bandmates to just be yourselves and express yourself musically. It was fun. In that way, he had the ability to bring out the best in everybody. Listen to “Jazzical,” a previously unreleased Jim Hagen original performed with Rod Bennett (vibes), Roger Brooks (bass) and Lance Allyn (drums). Peeples: Any other comments you’d like to make about Rod? Hagen: I’d probably go on for days with final comments. But just speaking for myself, I’m just going to remember all the good times we had, and use that as strength for going forward. A memorial service for Rod Bennett is set for June 9 at Eternal Valley Memorial Park in Newhall, starting at 1 p.m.
His family requests that in lieu of flowers or gifts, donations be made to the Santa Clarita Valley Food Pantry in the names of Rod Bennett and Val Pryor. Photos: Courtesy Jim Hagen; Valerie Pryor; Paige Hagen; Nadine A. Peeples; Stephen K. Peeples. Special thanks to Paige Hagen for the transcript. Santa Clarita journalist Stephen K. Peeples, a Grammy-nominated record producer and award-winning radio producer and website editor, has covered the Santa Clarita Valley music beat since 2004. He was Online Editor for The Signal from 2007-2011. He hosted and co-produced SCVTV’s WAVE-nominated “House Blend” local music show from 2010-2015. Peeples is also VP/New Media Emeritus for Rare Cool Stuff Unltd. and CEO of PetMeHappy.com. For more stories and info, visit http://www.stephenkpeeples.com/. For exclusive behind-the-scenes interviews, subscribe to his YouTube channel.